Today I am showing you an outfit I created in collaboration with H&M. As I said on my previous post- I am hosting a giveaway specifically for Latvian readers and they have a chance to win a beach bag- just like the one I am wearing in these outfit pictures! This outfit is definitely something I would consider wearing to a music festival. I know that white color might not be the very best friend of music festivals as usually everything tends to get very dirty, especially in case of rain- but I believe that this outfit is a really great fashion statement and would really look amazing in festival setting! What do you think of wearing white in summer festivals? Šo un vēl arī nākošo rakstu rakstīšu daļēji angliski un latviski, jo šiem diviem rakstiem ir ļoti liela saistība ar konkursu kas pašlaik norisinās manā blogā sadarbībā ar H&M. Konkursā ir iespējams laimēt vienu no 25 H&M Loves Music kolekcijas somām un tieši šajā un vēl nākamajā rakstā es parādīšu 2 veidus kā sakombinēt šīs somas kopā ar H&M vasaras kolekcijas drēbēm! Šis tērps ir pavisam noteikti viens no “outfitiem”, kuru es labprāt vilktu uz mūzikas festivālu. Un lai gan baltā krāsa pavisam noteikti nav festivālu labākais draugs, jo viss vienmēr tik ātri nosmērējas, it īpaši lietus laikā. Manuprāt šis “outfits” ir ļoti stilīgs un lieliski izskatītos mūzikas festivāla vidē! 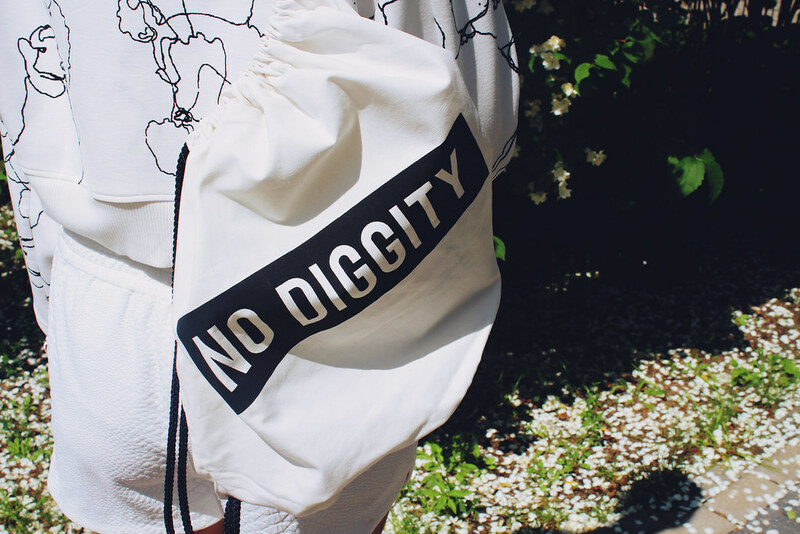 I'm in love with your sweater and the no diggity backpack! Very nice outfit Maddie! wow love the outfit! The jumper is so cool!! 🙂 love the sandals! Oh wow, i love this total white outfit! The sweater and the shorts are so cool! Perfect look!! I especially love the shoes and sweater! This sweater is so chic. i think you are right. This would really be a cool outfit for a music festival or a gig. Very nice. very pretty!!!! :))) I bet all eyes on the festival are on you! that sweater is so cool!! love the print! Those poodles are just too cute!